The Mountain Equipment Randonee is a dextrous yet warm pile-schoeller mountaineering and ski glove. It features a Schoeller Dry Skin Extreme (with 3xDry finish), a Pittards Amortan Goatskin leather palm and a fibre pile lining throughout. The Schoeller Dry Skin Extreme fabric combined with the lack of a waterproof membrane means the Mountain Equipment Randonee Glove breathes exceptionally well and also dries very quickly. This is particularly noticeable when working hard where many other gloves would begin to get filled with condensation the Randonee manages this moisture meaning your hands stay drier and subsequently more comfortable. This also helps when they have, perhaps inevitably, become wet as you can continue to wear them and they will dry throughout the course of the day (obviously this won’t happen on damp days at -10°C) or whilst inside your jacket. However, this breathability and quick drying comes at a cost of wind resistance and waterproofness. 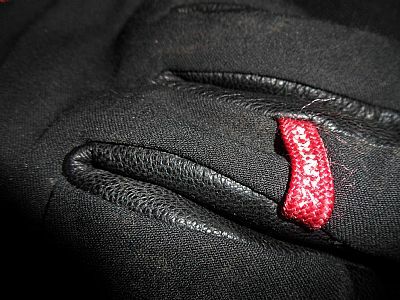 On windy days or whilst stationary you will quickly notice how the heat is stripped from your hands as the fabric allows cold air to relatively easily circulate through the gloves (an over mitt is the perfect solution to this problem). Exceptionally good breathability and drying time. Great dexterity whilst providing good levels of warmth. “Short cuff” is long enough to adequately cover wrist and provide a snug seal in conjunction with jacket layered over. The newer style have leather between the fingers providing better durability. The Schoeller Dry Skin Extreme fabric provides little wind resistance and gets easily saturated. Stitching problems have meant the first pair I used both had a seam open across the back of the hand whilst in use. The soft nose wipe area on the upper thumb, whilst a nice idea in principle, has disintegrated on the first pair I used whilst daggering on icy snow. The Mountain Equipment Randonee Glove is a great all round glove, excelling in most situations but particularly when working hard whilst needing good dexterity.